VINDICATION #1 plays out like a police procedural. The narrative is focused on a loose-canon cop and his obsession with ensuring a black man exonerated by DNA evidence doesn't stay free for long. However, the focus on the internal police element pushes the social commentary to the back burner in favor of genre tropes. 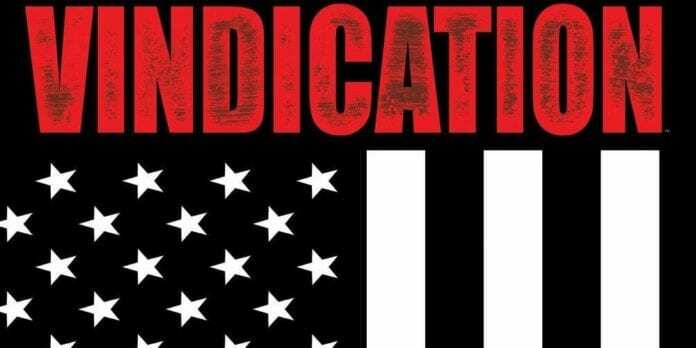 Vindication #1 introduces readers to a story with all the makings of a traditional police procedural. When a black man is exonerated by DNA evidence after ten years in prison, the cop who put him away makes it his mission to ensure the man doesn’t remain free for long. Detective Chip Christopher is obsessed with proving Turn Washington’s guilt…even if he has to distort the truth in the process. Writer MD Marie does a good job of keeping readers guessing about certain key points in Vindication #1. She gives readers the sense that Washington is an innocent man caught up in a corrupt system. Turn’s past is used as a means to seed doubt about his innocence, though, and there are forces at work intent on proving him guilty even beyond the detective. Marie dedicates much of this first issue of to police drama following Detective Chip Christopher. He’s a brash, loose-cannon loner who refuses to play by the rules, thus embodying many of the classic genre tropes. This sense is highlighted when he’s assigned a new partner, a fact he seems largely ambivalent toward. However, that reliance on the cop drama elements can be a liability in certain regards. Vindication #1 ends up centering its narrative on the police procedural element, making the detective our protagonist. He’s the only character we have to connect with from a narrative standpoint, and thus we end up centering the narrative on his absolute faith in Turn Washington’s guilt and his quest to prove it. It will be interesting to see how the next several issues play out. There’s not as much in this first issue to latch onto if you’re not a fan of the cop drama genre, though. The lines provided by Carlos Miko and Dema Jr. are rich with detail. Each panel features intricately-drawn backgrounds, grounding us in the reality of the world laid out in Vindication #1. The character designs are also well done. Miko went with a realistic style for these figures, which could backfire if not for the meticulous detail work. That said, the characters are primarily shown in static positions, and often with blank facial expressions that don’t really sell the emotion the writer is attempting to convey. As a result, the book lacks a bit in terms of dynamism. The colors provided by Thiago Goncalves are muted, employing a lot of earthy tones. Even though they’re understated, you can tell there’s plenty of skill at work. Goncalves pays close attention to the use of shadows and conveying how light hits characters’ faces. Vindication #1 should be a hit for fans of cop dramas, though the broader themes of the book have yet to really manifest in the narrative. The book has shortcomings, but it lays the groundwork for what may still develop into an engrossing narrative.